One of the highlights of SpaItalia at the weekend was the appearance of the Maserati GS Zagato which was driven round the Belgian F1 track during the weekend by the design firm's boss Andrea Zagato. First unveiled during the Ville d'Este Concorso d'Eleganza at Lake Como in late April, this was the first time the coachbuilt car had been seen in dynamic action. Andrea Zagato was at SpaItalia over the weekend, the two-day event having become something of a regular entry in his diary in recent years. "I came here a couple of years ago when Zagato was featured and also when there was a big meeting of the [Alfa] SZ and RZ," Andrea Zagato told Italiaspeed. "I enjoyed the weekend and we have been invited to show the car which was seen at Ville d'Este and which will probably go to Pebble Beach this year, and since we spent a nice time in Spa two years ago we decided to come." Also present was the irrepressible Maria Teresa de Fillipis - the first ever lady F1 racer who is synonymous with the Trident marque - a guest of the SpaItalia event, and she was chauffeured in the GS Zagato round the high-speed Grand Prix track by Andrea Zagato. The GS Zagato in between joined five very historically-significant Maserati models in a centrepiece display at the track which recalled the 50th anniversary of the F1 title which was claimed by legendary Argentinean racing driver Juan-Manuel Fangio at the wheel of the immortal 250 F.
Based on the Maserati GranSport Spyder, the GS Zagato oozes with the firm's tradition design language, such as the 'double bubble' roof. "This is a typical Italian berlinetta," says Andrea. "Its compact, small, nice to drive, it is based on the GranSport Spyder. With an aluminium body its typical of the berlinettas of the fifties and sixties and with typical Italian lines made by Zagato, simple, clean and with an air flowing design." 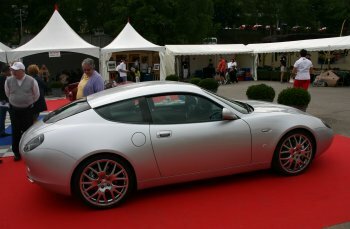 Much work has been carried out on the GranSport chassis by Zagato's engineering team. "The roof becomes structural to the car, of course the Spyder has a stiffer chassis so when you enclose the Spyder it becomes even stiffer than the standard car because of the shorter wheelbase and there is the contribution of the roof," says Andrea. Inside the changes are discreet: "We have only done little bits as we want to keep the functionality of the car," he adds. First unveiled during the Ville d'Este Concorso d'Eleganza at Lake Como in late April, this was the first time the coachbuilt car had been seen in dynamic action. The GS Zagato is destined to remain very exclusive, just a handful will be built. "The car is one of nine cars that will be delivered to nine different customers," he says. "We are trying to select the customers from amongst the ones that have asked for the car, and we want to have one car sold in nine different countries, if it is possible." The GS Zagato is the newest exclusive sportscar model to be specially coachbuilt by Zagato; last year the historic Milan-based firm created the Ferrari 550 Maranello-based GTZ, and the new car at SpaItalia is the latest unveiling in a growing new trend that has seen the famous Italian designers returning to their roots and reviving a glorious tradition of building bespoke cars for wealthy clients. "There is big demand for this type of car, where there is a big difference between the mass production cars," says Andrea. 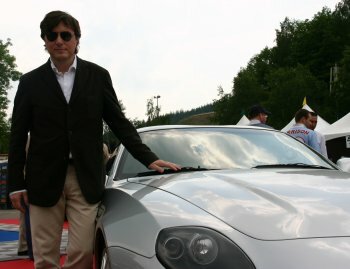 "They don't loose the value, they keep the value or increase the value, while whatever car you buy today, even a top class sportscar tends to loose its value in a while, as today they are always increasing the production of top cars, and facelifts decrease the value of previous cars, while we have made only nine cars, each hand made of aluminium. While Zagato don't reveal pricing, each car is tailored to the buyers requirements Andrea does say: "We calculate for atelier cars, for 12-cylinders the price should be around 500 [thousand euros] and for 8-cylinders the price should be around three hundred [thousand euros]. Expect more coachbuilt cars from Zagato in the next few years as the revival of the 'atelier' tradition gathers pace amongst the Italian design houses. "We are an atelier since 1919 so our plans are consistent with what Zagato has been for ninety years, we remain an atelier and we enjoy building cars for collectors and buyers," he says.